STS-119 has launched after an issue-free tanking and countdown, following engineering work to troubleshoot a LH2 (GH2) leak from the Ground Umbilical Carrier Plate (GUCP) attached to the External Tank. Discovery launched at 19:43pm local time launch, with added focus on the T-0 umbilicals on the TSM (Tail Service Masts) – following an incident on STS-126. Leak checks were completed overnight, as the Rotating Service Structure (RSS) was retracted to reveal a floodlit Discovery on Pad 39A. Work was behind schedule, due to slight issues with the left and right GUCP (Ground Umbilical Carrier Plate) pivot assembly. Troubleshooting has been taking place on the GUCP following a red line leak from the hardware when the tank reached around 98 percent full on Wednesday. No “smoking gun” has been found on the root cause of the issue, though the changeout of seals and components, ahead of re-attachment and re-torquing a tight fit on the seal, is believed to be sufficient for ensuring the problem does not reoccur. “There was some damage to the flight seal, but we’re not sure that’s the cause,” noted launch director Mike Leinbach. “There was a bit of discoloration on the QD (Quick Disconnect), but that might have been to the hydrogen flowing where it shouldn’t have been. If it doesn’t leak, we’ll be perfectly fine to launch. “The discoloration was on a surface inside the QD, and we’re 99 percent positive we didn’t have LH2 (inside), we’re sure we had GH2 in there. At one point engineers were deemed to be eight hours down on the timeline, which was at least halved by the time second shift started work on Saturday evening. Flexibility exists in the timeline for the commencement of tanking – if had it been required. However, tanking started on schedule, with the first test of the Engine Cut Off (ECO) sensors providing expected results. The SIM test also was issue-free. Importantly, tanking suffered from now tripped leak detector’s, a sign the new seal on the GUCP worked as required. The only “concern” was a bat, which was seen hanging from the -Z side of the tank. Another bat had to be saved by engineers after falling into the water bags at the foot of the SRBs. The STS-119 crew ingressed into Discovery, hatches were closed, and no issues were work ahead of a spectacular launch, which has been classed as issue-free via early results. STS-119 is now into Flight Day 1, ahead of opening inspections on Flight Day 2 via the OBSS (Orbiter Boom Sensor System). While all the recent engineering work has been on issues such as the Flow Control Valves (FCVs) and the GUCP issue, the lessons learned from previous flights – and their resulting get-wells – once again portrays the multi-element focus on ensuring a safe launch. One such threat to a “clean” launch is ice, usually liberating from the External Tank (ET), with a similar potential risk to the orbiter’s Thermal Protection System (TPS) as foam liberation. While amazing progress has been made on the highly complex issue of foam liberation, a “new” ice threat was observed on STS-126, via a build up on the T-0 umbilical plate mated to Endeavour. The T-0 umbilical – located on each side of the orbiter – is mated to the orbiter via retractable plates in the Tail Service Masts (TSMs), which can be seen either side of the orbiter’s aft. These umbilicals are retracted at SRB (Solid Rocket Booster) ignition. Via engineering camera views from inside the TSM, ice was seen to have developed on the carrier plate of the LH2 umbilical during tanking. Obscured by view until lift off, the ice then remained with the orbiter, before liberating 26 seconds later, thus becoming a debris threat. On this occasion, the ice avoided impact with the vehicle. This led to an engineering investigation into the issue, its risks, and a forward plan on mitigating that risk, resulting in five large presentations being created for the Program Requirements Control Board (PRCB) earlier this year. All five presentations and the 330mb engineering super slow mo camera “all views” video are available on L2. “Problem Description: At 26.696 MET (Mission Elapsed Time), debris was observed to liberate between the LH2 T-0 umbilical and port OMS pod,” noted one overview presentation on L2. “Real-time observations of focused inspection using OBSS (Orbiter Boom Sensor System) on Flight Day 2 did not show any apparent residual damage or artifacts. As part of the investigation, the KSC Imagery Assessment Team (IAT) reviewed imagery from 119 missions and concluded that frost/ice had formed in the LH2 T-0 seal area on seven missions (STS-62, 87, 108, 111, 116, 123 and 126). 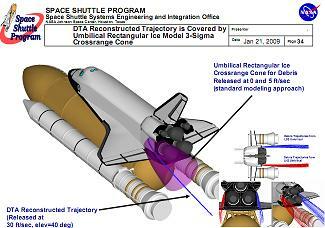 However, STS-126 is only known launch to have liberated ice/frost from LH2 T-0 Umbilical area post T-0. 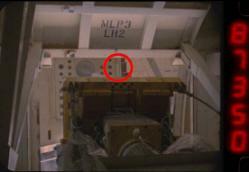 There are no known releases from the LO2 umbilical on the opposite side of the vehicle. To gain a full understanding of the historical database on ice build-up in this location, images were shown in one presentation of every TSM camera view of each of the aforementioned launch. NASA engineers have such a vast database available for every flight back to STS-1. “LH2 T-0 Umbilical Findings: KSC Image Analysis Team (IAT) reviewed imagery from camera E022 (located inside the LH2 TSM) for 119 additional missions for ice/frost build up on the Orbiter LH2 T-0 Umbilical during T-0 retraction. 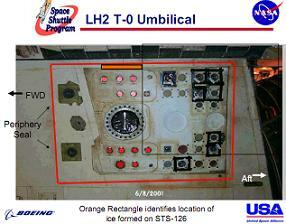 “Ice/frost had formed on the LH2 T-0 seal area on 6 other missions: STS-62, 87, 108, 111, 116, and 123. “6 additional occurrences of ice/frost were found on the interior plate surface (away from the seal perimeter). All of these occurrences were prior to STS-26R. Mainly small formations around the main LH2 line. Redesigns appear to have fixed the problem as it does not appear again. “LO2 T-0 Umbilical Findings: KSC IAT reviewed imagery from camera E021 (located inside the LO2 TSM) for 116 additional missions for ice/frost build up on the Orbiter LO2 T-0 Umbilical during T-0 retraction. The reason for the ice build-up itself is believed to be caused by a combination of factors, ranging from the design of the TSM to water intrusion into the hardware. “Due to the design of the T-0 umbilical, ice formation internal to the cavity is possible,” added the overview presentation. “Leading theory is cold temperature in combination with low delta pressure to ambient, along with potential water intrusion from rain or condensation, is allowing moisture intrusion into umbilical cavity resulting in ice formation. Given debris threats are taken very seriously, a risk acceptance presentation was created by Space Shuttle Systems Engineering and Integration Office (SE&I) on the subject of Probabilistic Risk Assessment (PRA) and Debris Transport, to further understand the threats to both the aft of the orbiter and SRBs. While “potential risk is to Ascent, Re-entry, and for Structural Damage to the Orbiter,” was calculated by the worst case liberations (in mass) via four simulations ranging from 0.1 to 2.8 lbms of ice, the design of the orbiter provides an element of shielding to several critical area of flight hardware. “OMS Nozzle and SSMEs are entirely shielded by the OMS Pod and the Fuselage for every Mach/mass combination,” noted the SE&I presentation. “The Body Flap and the Orbiter Base are somewhat shielded by the OMS Pod and the Fuselage, thus reducing their risk. “The Body Flap and the Elevons are far enough away from most trajectories that a majority of the dprox cones do not impact them. L (left) SRB Aft Skirt has a low risk of impact due to the distance from the release points. Fuselage Side and OMS Pod are the areas of highest risk for all masses. “For a release rate of one per flight, the largest mass, mass 2.7931 lbm, has the highest risk for every component: 1 in 47 probability of impacting the Fuselage Side. 1 in 82 probability of impacting the OMS Pod. In conclusion to SE&I’s 35 page presentation, only high mass liberations of ice are to be deemed as a viable risk to causing damage to orbiter or SRB – specifically the Booster Separation Motors) – during ascent, should the liberation manage to hit the vehicle in the first place. “Ice from perimeter of LH2 T-0 Umbilical has transport mechanism to Orbiter Side Fuselage, OMS, and RSRB. Other Orbiter Components are shielded enough that they have a low risk of impact for any of the masses analyzed. “Impact (potential) on Orbiter limited to Side Fuselage, OMS Pods, Elevons, and edge of Orbiter base and Body Flap. No impact (potential) on SSME or OMS nozzles were sustained due to shielding provided by side fuselage and OMS. “Impacts on RSRB occur at Inboard Side Aft Skirt at higher masses only. Maximum energy impacts occur at Mach 1 or Mach 1.26. Impacts with ice of mass 2.8 lbm (largest analyzed) can result in impact KE of 2563 ft-lbf on Orbiter and 2838 ft-lbf on RSRB Aft Skirt. “Impacts with ice of mass 0.1020 lbm (smallest analyzed) can result in impact KE of 142 ft-lbf on Orbiter and does not impact RSRB Aft Skirt. Aft BSMs show low risk. Specific regions of higher concern have lower risk than overall PRA. Despite the low risk, KSC engineers inspected the TSMs and T-0 umbilical plates that are being used on STS-119’s launch for any issues with their seals and components. “STS-119 Mitigations: STS-119/MLP-1 internal can seals were inspected prior to T-0 mate and verified to be free of defects,” noted the United Space Alliance (USA) presentation. “Post mate to orbiter and prior to peripheral seal installation, the visible portions of the internal can seals were inspected and verified to have positive contact to orbiter. “Peripheral seal was inspected prior to installation and verified free of defects. Peripheral seal was inspected post installation in VAB and verified free of gaps. Peripheral seal was inspected post rollout to pad and verified no change in configuration. 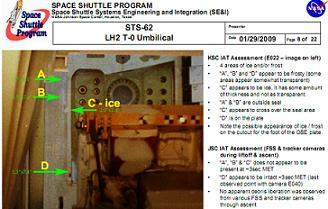 “STS-126/MLP-3 internal can seals and peripheral seal were inspected post flight with no defects or degradation noted. MLP-3 post launch and MLP-1 pre-orbiter mate OMRS purge tests performed with no anomalies reported. USA also worked on a “rain diverter” which has been added to the TSMs for STS-119, as a form of extra protection from one of the determined drivers of ice formation on the T-0 umbilical area. 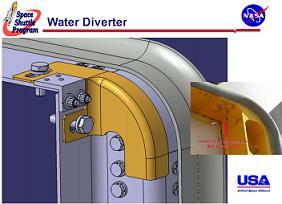 “Design and Install a Rain Diverter – KSC ERB (Engineering Review Board) approved Rain Diverter installation for STS-119 on LH2 and LO2 Umbilicals on 01-23-09. OPO (Orbiter Project Office) and SE&I concur with installation. Also noted in the presentations is the ability to apply a release agent to the T-0 umbilical plates, which would allow for a fast release of any ice build-up, before the vehicle reaches velocities that would allow the ice to become a debris threat on impact with orbiter hardware. However, no information on the release agent’s approval for STS-119 was noted on processing notes during the run up to STS-119’s launch countdown. “Application of release-agent to the Orbiter T-0 Umbilical plate: OPO, Boeing Design, M&P and SE&I are evaluating the possibility of applying a release-agent to the Orbiter T-0 Umbilical plate. As the ultimate back-up to ensuring no damage has been caused by any ice that may build-up on Discovery’s T-0 umbilical plates, special attention will be focused on the area of the orbiter during ascent via long range telescopic cameras and on orbit inspections (Flight Day’s 2 and 3). However, given the mitigation procedures carried out on STS-119, and the historical lack of flights bar STS-126 that have seen ice liberate during first stage from this area of the vehicle, the issue is unlikely to be noted again over the remaining flights of the shuttle.